The single over head cam Nissan RB30 engine was made from 1985-1991, originally for the Nissan Skyline and Patrol. Holden bought the rights to use the engine for the very popular VL Commodore. This Kelford Cams range has been used with great success in many hot street, track racing and drag racing engines. If you can't find your perfect camshaft within our catalogue, simply order the custom camshaft and we can either manufacture a cam to your specification, or design a profile for your application. 260/260 Degrees advertised duration, 10.90mm/10.90mm lift. 270/270 Degrees advertised duration, 11.30mm/11.30mm lift. 290/292 Degrees advertised duration, 12.20mm/12.20mm lift. 304/314 Degrees advertised duration, 13.70mm/13.85mm lift. 274/274 Degrees advertised duration, 12.95mm/12.95mm lift. 284/292 Degrees advertised duration, 13.70mm/13.70mm lift. 296/304 Degrees advertised duration, 13.70mm/13.70mm lift. 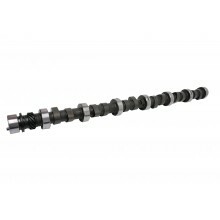 Custom camshaft for Nissan RB30 OHC engines.